I have written very positively of pianist/composer Marc Rossi’s efforts in the past. His Hidden Mandala ( 2008) recording was truly something that deserved to be found. Fully educated and accomplished in both Western and Eastern forms, Rossi has spent a good deal of his time these last few years composing and performing music that represents a vigorous and cogent co-mingling of these musical traditions. On Hidden Mandala, Rossi also proved that he was among less than a handful of pianists who have managed to successfully integrate that instrument into the traditions of Carnatic music while deftly maintaining roots in the modern jazz idiom. If anything, his latest recording, Mantra Revealed (Innova 816), shows even more cultural breadth, as Rossi adds some energetic Afro and Latin vibes to the itinerary. “Refuge in the Rhythm” is a showcase for vocalist Geetha Bennett and saxophonist Lance Van Lenten. The liner notes refer to a “Wayne Shorter-like jazz-fusion melody” which very well may be true, but I often hear echoes of Dexter Gordon (Sophisticated Giant era) in those lines Van Lenten’s playing. We all have different ears. On the effervescent “New Beginnings” bassist Bill Urmson and guest guitarist Bruce Arnold get to let loose with some fusion electronics. The composition, though you would never know it because of its western harmonics, is a cyclical creation based mostly around a Kriti, a South Indian music form. The complex time changes are handled effortlessly by drummer Mauricio Zottarelli. Despite its 12-minute length, this engaging progressive jazz piece should receive extensive radio play. “Sahara” and “Voice of a 1000 Colors” serve as vehicles for swinging African and Latin grooves. Rossi’s piano playing, seemingly more out front on these tunes, is relentlessly enjoyable. Rossi’s featured solo piece, "Vertical Fantasy on You Know You Know," is a thought- provoking foray based on the main riff from composer John McLaughlin’s famous Mahavishnu Orchestra tune “You Know You Know.” Starting off like Chick Corea may, the pianist then sets a ladder against the motif and climbs it. Rossi’s compositions are gamut runners and his fine group and guest stars sure know how to carry the baton. 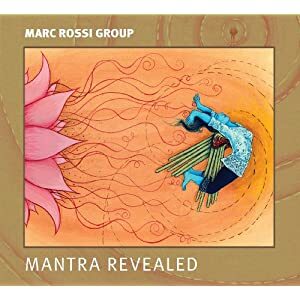 Marc Rossi himself, a pianist with prodigious chops, is the anchor leg in this beautifully recorded genre-crossing relay. Note: The CD package comes complete with detailed liner notes from the well-regarded jazz journalist Fred Bouchard, who surprised and pleased this reviewer by referring to some of my earlier comments about Marc Rossi’s music.